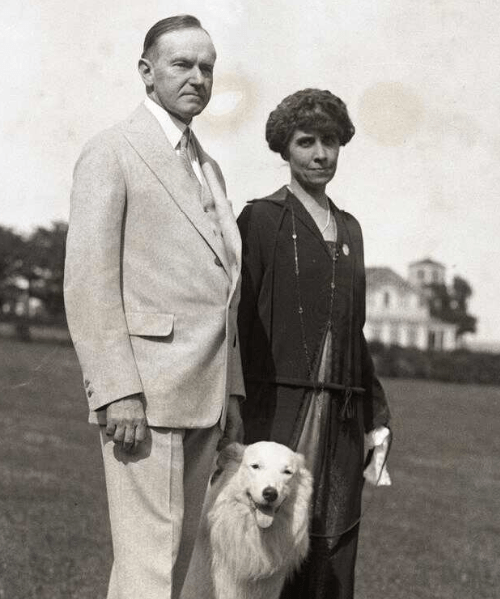 President Coolidge, his wife, Grace, and one of their white collies, Rob Roy, circa 1925. 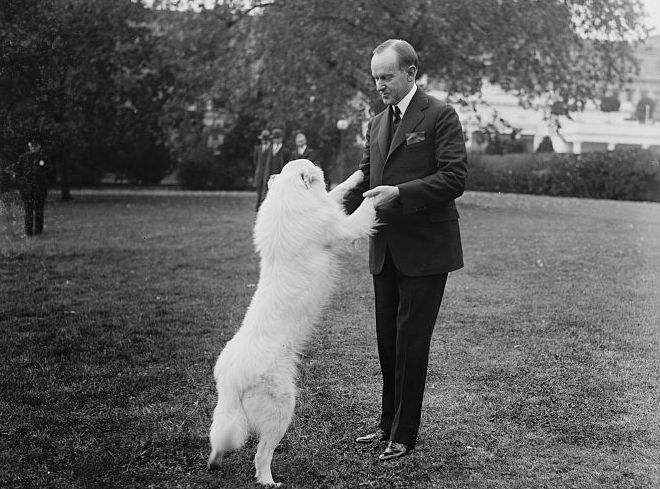 President Calvin Coolidge was so widely known as an animal lover that some people began sending their unwanted pets to the White House. As a result, our 30th president and the First Lady, Grace Coolidge, had an unsurpassed menagerie at the mansion. Animals as diverse as a pair of lions, a wallaby a pigmy hippo, and a raccoon were part of the extended First Family. However, the Coolidge’s two stunning white collies, Rob Roy and Prudence Prim, were probably their most beloved pets. 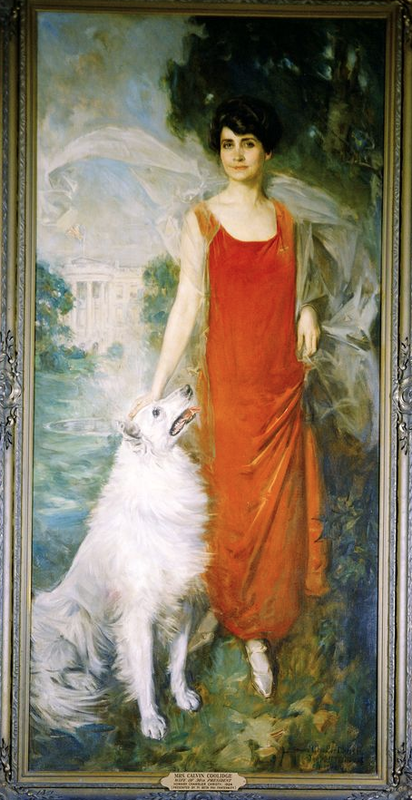 Thanks to a painting by Howard Chandler Christy — depicting a seated Rob Roy looking up at Grace Coolidge, who is wearing a striking red dress — that hangs in the China Room of the White House today, Rob Roy is also the best-known Coolidge pet. Grace Coolidge became enamored with white collies after seeing one perform in a circus. She purchased Rob Roy, born around 1922, from Stephen C. Radford Jr.’s Island White Kennels in Oshkosh, WI, according to the Calvin Coolidge Presidential Library & Museum as well as other sources. Although the dog’s name originally was Oshkosh, the First Lady changed it to Rob Roy, after a popular cocktail. The name shows a bit of whimsy since it was the time of Prohibition in the United States. Well-known for his hatred of any squirrel that dared to cross the White House grounds, Rob Roy slept in the presidential bedroom. Terrified of the White House elevator, Rob Roy would press himself as firmly as he could against the elevator floor for security whenever he took a ride on it. Rob Roy frequently appeared with the president or the First Lady at public events at the White House and posed with them for photographs. In fact, Rob Roy became the first dog to be part of an official First Family photo portrait on June 30, 1924. The portrait is poignant because shortly after it was taken, one of the Coolidges’ son, 16-year-old Cal, was in such a hurry to change his clothes that he did not wear socks. A resulting toe blister became infected, and the teenager died from the wound just a week after the photo was taken. Rob Roy is immortalized in this painting with First Lady Grace Coolidge. It hangs prominently on the south wall of the China Room in the White House, and was said to be Jackie Kennedy’s favorite White House painting. Because the dog was so much a part of the family, the First Lady insisted on having Rob Roy pose with her for her official White House painting in 1924. When she debated wearing a red dress against a blue background, her husband, known for his dry wit, suggested she could also achieve a red-white-and-blue theme by wearing a white dress and dyeing Rob Roy red. President Coolidge plays with Rob Roy, Oct. 31, 1924. In September 1928, Rob Roy developed stomach problems and was rushed into emergency surgery at Walter Reed Army Hospital. Unfortunately, he did not survive.